Print this Brita Bottle coupon before you go to the store to buy a Brita Bottle with Filter. Ask the cashier if they accept printed coupons. I’ve used printed coupons at various stores including Loblaws and Walmart and had no problems so far. 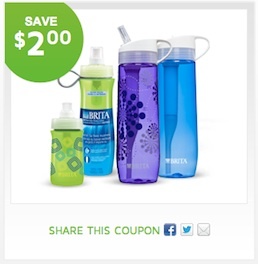 This Coupon is to save $2 off any Brita Bottle product. Get great-tasting water on the go, without the cost and waste of bottled water. The reusable Brita® Bottle filters ordinary tap water as you drink, to make tap water taste great anywhere. It’s BPA-free, dishwasher safe (top rack) and recyclable.